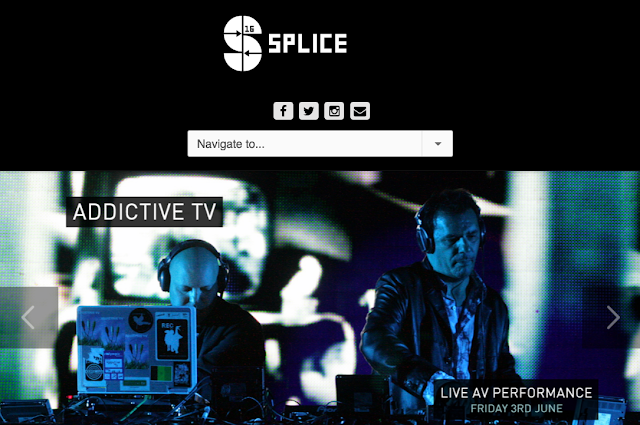 "Addictive TV�s line-up is founder Graham Daniels and mash-up guru Mark Vidler, aka Go Home Productions. The pair met in 2005, through EMI, working together on Mark�s album track Rapture Riders � remixing Blondie�s Rapture with The Doors Riders on the Storm. The album Mashed was released in 2007. Graham and Mark kindly agreed to an email interview, thank you very much guys for taking the time to answer rather long questions! The performing duo will be performing 3-5 June, 2016 at Splice - an exciting new performing arts festival. Q. I have done a blitz in the last few days, watching the online video documentation of your work since 2005, and from this I can see that your work has developed both stylistically in terms of your mediums and methods and in terms of the types of productions that you do, moving from creating dance music to a more lo-res visual aesthetic to creating live audio visual performances in which the visual quality is much more cinematic. Can you tell us about how your work has evolved aesthetically and stylistically since you started working as Addictive TV and has the productions you do such as directing video mash-ups for alternative film trailers and creating content for gallery spaces had an influence on the development of your work. GRAHAM: I think all of an artist�s work influences their work over the years, I know it has ours. We�ll try an idea or method out, and find that if it works we want to repeat the idea again or do something similar. In fact our latest project Orchestra of Samples is a direct evolution of our mode of working, building new visual music from lots of small snippets and samples, but instead of the samples being diegetic sound effects from films they�re musicians playing different musician instruments that we�ve filmed. Q. However, there are some constants in your work such as your unique take on working with a sample as you say yourself you create music audiovisually (which I think is a very cool way to describe your approach). This audiovisual method of sampling, where you create music from sampling audiovisual mediums such as tv, video, film and keep the video and audio together in the sample has endless possibilities. Can you tell us some more about how this audiovisual method has evolved and is still evolving? How do you get your ideas, do you keep it simple by focusing on mixing only two sources and from this generating your tracks or do you span your net wider, looking for interesting sounds and visuals from many sources. Do you like to follow a thematic route or a humourous one. Or does it depend on the project or venue you are working with? MARK: The only real constraint � if it can be called that - in this style of working is the samples you�re using and where they�re from, ie if you�re remixing a film you only have the film to sample from if you understand my point. GRAHAM: It�s the same if we�re producing a commercial �remix� for a client � you�ll only have the samples they give you. But I don�t see this as a constraint it�s just the boundaries you�re working within as an artist � ie, it�s no different to an artist who�s decided to work with bronze or, say, plaster or water colour - they�re not suddenly going to use wood or plastic or oil based paint in their piece, and if they do then that�s the equivalent to ourselves using completely different samples from another source, so it�s not a constraint it�s just �rules� you�re setting yourself. And within those, we�re always developing our AV language, which we like to call splintered narrative or fractured narrative and I often think this approach is only possible these days with audiences understanding so much filmic shorthand. But then again, back in the early 20th Century film makers like Luis Bu�uel were experimenting with what we might now days call �cut-up�. Q. The unified music track that you create from your audiovisual samples is such that one would find it really difficulty to believe that such tight and integrated music has come from such disparate TV/video/film sources. I really found it so hard to "work it out" because the mixing was so seamless, in the end I stopped trying to work it out and enjoyed the unity of the music alongside the visual sample. How do you manage to create such a unified music track from such disparate audiovisual sources. How do you musically structure your samples? Is it music or visual led or is it from an external plan of your own or from a thematic approach? MARK: No, we create both the music and video edit at the same time - and I think that's what makes our work look and sound like it does. GRAHAM: We�re interested in the idea that you can see the building blocks of the music so after sampling the material, the way we work is to compose sound and image side-by-side, so we effectively compose the music and video edit as one process. Lots of files are being sent back and forth between various computers, it's a two-way process that's always evolving until we're happy with the results! And a plan of how to create the piece comes from what the idea is, whether it�s a film remix or a more traditional music mash-up of 2 or more tacks being fused together or even a track for our new Orchestra of Samples project � they all have different but at the same time similar approaches. It�s good to hear you say you stopped trying to work out how we create our visual music, as yes when you see a film you don�t generally watch wondering how they created a particular scene or listen to music wondering how something was recorded� as you say, just enjoy it! Q. The term track is used to describe both the creation of the music and the creation of the video and demonstrates how audio visual mediums crossover even in terms of the conceptualisation of the terms used to describe the content. How does this track approach to creating the music be realized and communicated to the audience in the visual domain of the video screen. GRAHAM: Obviously I can�t speak for other artists, but for us it�s quite clear to an audience that we�re moving from one track to another, like a band or DJ. For us a track, conceptually, is no different to an audio track or song that a DJ would play or a band performs except that ours also has video, whether we�re performing our audio/video remix set or our current live cinema project Orchestra of Samples. In fact, with the latter like any band performing, we often stop at the end of a song or track, especially if Mark is playing live guitar during it as well or we�re performing with live musicians, which we often do with that project. The video screen just becomes an extension of the music, an extension of us. Q. You describe your work sometimes as a visual music? Can you tell us a little more about that. For example, what musical elements are your looking for in the video sample and what visual elements are you looking for in the audio sample. Are you making interesting discoveries about the behaviour of music and visual when you are committed to working with them in such a unified way. Are there things that work well and others that don't work so well? MARK: Yes, there are always things that work well in one piece that don�t work in another, wide shots for example often don�t work if they have a specific sound in them that we�ve sampled, because the audience needs to see it quickly. GRAHAM: We�re very much into the idea of moving images having their own rhythm, so we�re usually looking for close-up images that work well with their audio counterpart. In the case of a movie remix, then the AV sampling has to be about choosing the rights bits to create the track from, individual clips that tell something of the story, impart information but at the same time have a great sound. If it�s a more traditional music mash-up, then it�s sampling all the different elements of both audio and video that work together to create something new. As I say, images have their own sense of rhythm in just the same way sounds do. Q. I believe that your 'Orchestra of Samples' project and concept is a very exciting development and appears to me to be another branch in the progression and development of your practice. Here the sample is your very own production yet, you are using your audiovisual sample method in a new way. Does the project expand as you add more samples to the mix? How did this concept start and how is this project evolving for you. GRAHAM: Yes, the project certainly expends as we add more samples, although having said that we still need to create new tracks using the newly added samples. We�re loving this project, it�s taken us five years to get this far and it�s a huge undertaking, which is why very few artists have ever created something quite like this - it also takes a huge amount of organising! We really wanted to collaborate with as many different musicians internationally as possible and that�s very impractical in the real world but of course in the digital world of sampling, it�s very simple! So the project started by us taking a camera and recording equipment with us while touring and gigging around the planet for a number of years, spending time filming local musicians everywhere we travelled. That�s now more than 200 musicians in something like 25 countries from Brazil to Senegal in West Africa, even Egypt and Kazakhstan! We then sampled all the recordings, creating new music, visual music I should say because audiences can see the samples! When you see the show, we�ve recontextualised the musicians as if they are playing together, when in reality none of them ever met. MARK: Orchestra of Samples is also an exploration of musical probability, the idea of bringing together very diverse musicians who wouldn't normally play together, and more to the point their instruments which wouldn�t normally be heard together! It�s a musical journey without borders and the freedom it allows is wonderful. I�ve found working in this way fascinating, especially as I�m also a guitarist, and working outside of normal musical conventions has really opened my eyes, finding really unexpected combinations of instruments we didn�t know about. If it sounds good, why not have an ethereal sounding Japanese Koto used in a pulsating electro track with Turkish tanbur � both are stringed instruments. In fact one of the most fascinating things we've filmed so far was in Mexico with an expert on ancient music who spent years searching for naturally tuned fragments of rock, as he feels hitting rocks would have been the first instrument humans ever played. He lays out the fragments in a musical scale, a bit like a �stone xylophone�, and simply plays them by hitting them with another small stone! Incredible and it sounds beautiful. The original �rock music�! Q. In one of the video documentations of your earlier performances when audiovisual performance was quite new you talk of the importance of freedom for the artists involved to explore their own techniques and approaches in terms of techniques and content. I also say this to in relation to the development of visual music work in general, I too loved that the field was free from rules and regulations. Can you tell us a little more about what this freedom allowed you to do as Addictive TV. Is this still the case that having freedom to explore technologies, mediums and methods and in particular allowing a cross over to take place between audio and video mediums still important to you and from this freedom of expression do you think this has benefited your own development as Addictive TV. Do you think this is important of the development of the live audio visual performance field? GRAHAM: Yes, I think it�s still the same today, there�s complete freedom in this field that doesn�t exist in, say, more conventional music scenes where there is structured expectation. The AV performance scene is still very young and very small in the grand scheme of things, so artists are still making up the rules and trying different ideas, that�s what makes the whole scene still exciting. But that also brings with it lots of artists out there who I would describe as having fallen into an �experimental AV rut� that I wouldn�t describe as exactly challenging, but that�s just my taste � some people like a white dot on a screen for 30 minutes! And I also see many artists relying too much on technology to provide the aesthetic side of their art, rather than themselves � it�s different if the technology is the art but I do think a certain amount of warmth and artistic wonder has been replaced by technological wonder in the AV scene today. Your music and productions have the potential to pass comment audiovisually on other areas of cultural activity. As it stands the re-appropriation of video and audio from the closed systems of TV shows, Music Videos and Films opens out these systems into being a content that is accessible to us all as both consumers and producers. Do you consider other messages, topics and themes can be communicated with the choice of audiovisual sample? Q. How important is it to Addictive TV to create good entertainment and how do you keep your audiences engaged and interested in your shows and productions? Are you inspired by your audience and your fellow artists and entertainers? Do your interactions with them influence how your develop your future projects. Why do you think Addictive TV is so successful and popular? You can ask �what is entertainment�, same as �what is art�? To some degree all art is entertainment even if it�s thought provoking. But to us yes, it�s very important to be entertaining and we like to create visual work that�s very detailed with many edits, making it watchable again and again. Humour is also very important to us in our work and we�re definitely inspired by our audiences, by simply seeing what works and what doesn�t when we perform.